The vertical acceleration of the particles is the same and is the gravitational acceleration g. The initial vertical component of velocity is zero for all the particles. Since the vertical displacement is the same, all the particles will reach the ground simultaneously. So the correct option is (e). [Gravitational acceleration is independent of the mass of the particle and you should not be distracted]. The velocity of the particle when it returns to the ground level will have magnitude v and will be inclined at 60º with the horizontal as shown. 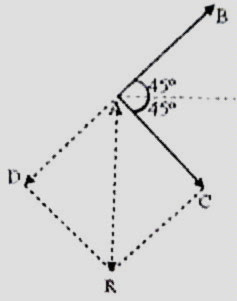 Therefore, its angular momentum with respect to the point of projection A will be mv×AC where AC is drawn perpendicular to the direction (CB) of the projectile just before it hits the ground. (4) A stone is projected at an angle θ with the horizontal. If the initial kinetic energy of the stone is E, what is its kinetic energy at the topmost point of its trajectory? (Neglect air resistance). We have E = ½ mv02 where v0 is the velocity of projection of the stone (of mass m). Since at the maximum height the projectile has horizontal velocity only and its value is v0cosθ, the kinetic energy at the maximum height is ½ mv02cos2θ = E cos2θ. The initial momentum of magnitude mv of the bullet is inclined at 45º with the horizontal and is represented by the vector AB in the adjoining figure. 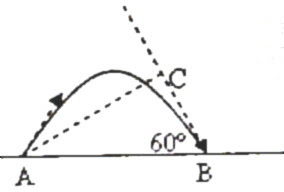 The momentum when the bullet reaches the horizontal plane passing through the point of projection during its return to the ground is represented by the vector AC. Its magnitude is mv itself and it is inclined at 45º with the horizontal. The change in the momentum is vector AC – vector AB. The vector –AB is represented by the vector AD so that vector (AC – AB) = vector AR. Since the magnitudes of the vectors AC and –AB are the same and equal to mv and the angle between them is 90º, the magnitude of the change in momentum of the bullet is √(m2v2 + m2v2) = √2 mv. The figure showing the vectors is given here just to make things clear. You should be able to find the answer without using the figure. You can arrive at the answer much more easily if you remember that there is no change in the horizontal component of momentum. The vertical component of momentum which has magnitude mv sin45º gets reversed so that the change in momentum is mv sin45º – (–mv sin 45º) = 2 mv sin 45º = √2 mv. In the next post we will discuss some more questions from this section.